From each trip you want to bring souvenirs or local treats to please your family and friends. In Rostov-on-Don, you can find anything, but there are things that are strongly associated with this southern city. Donnews.ru collected 8 ideas for proper tourist shopping. Despite the fact that Rostov is more Cossack than a merchant city, a Cossack checker or other paraphernalia can be a memorable gift from the trip. There are several shops in this city where you can buy kitchen utensils, interior items and even traditional Cossack suits. Shopping center "Solnyshko" (Bolshaya Sadovaya), 103/51, 2 nd floor, pavilion №14. Puffs from 1800 rubles, T-shirts from 850 rubles. Those who prefer more modern clothes, should pay attention to the Rostov designers who recently united on one electronic platform: rostovfashion.ru. Like Shop, Ribbon Disign, fashion laboratory Violetta Vaitiekunaite, amazing dresses from Olga Grinyuk - and these are just a few names and brands. Particularly conceptual things are created by designer Vladimir Ovechkin. The designer makes every effort to use symbolic for Rostov characters in his collections - for example, the image of the Gorky Theater, whose building is made in a form reminiscent of the tractor Kommunar. Well, of course, prints with cancers - with them you can buy and accessories, and clothes, and stripes. Ovechkin's clothes, of course, for courageous and ironic - you see, a quilted jacket with stripes is hard to imagine on every second passerby. Baseball caps from 1,5 thousand rubles, T-shirts - from 2 thousand rubles, bombers - 5 thousand rubles. Address: Lane Gazetny 47 B (building BC Slavians). Phone: +7 (863) 311-43-65. T-shirts from 1,5 thousand rubles, dresses from 2,5 thousand rubles, accessories from 350 rubles. 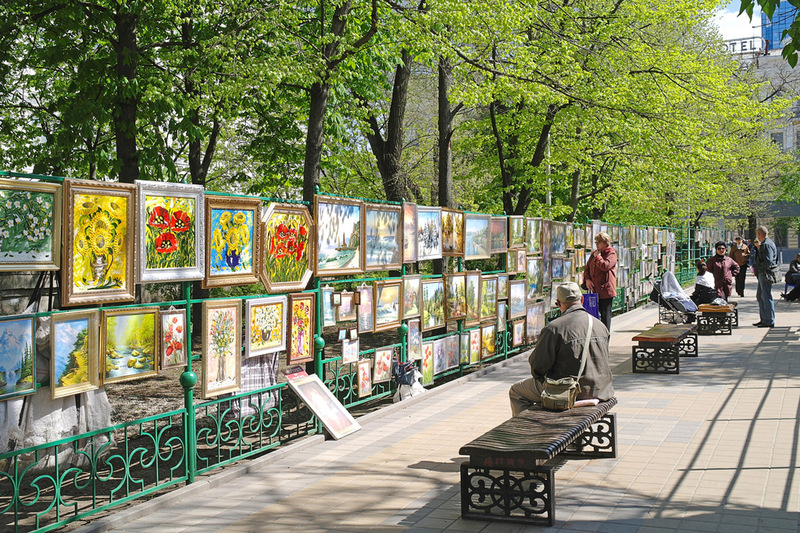 On one of the avenues of Gorky Park, Rostov artists display their paintings and objects of applied art. In addition, products of local craftsmen can always be found in souvenir shops "Terra kot, as well as in the creative space" Craft ". Address: Bolshaya Sadovaya street, 45. Prices - subject to an agreement. Figures from 180 rubles, toys - from 1000 rubles, scarves - from a thousand rubles. Address: Socialist, 140. Phone: +7 (989) 629-12-09. Wooden products from 800 rubles, ceramics - from 1000 rubles. A popular souvenir from Rostov is Semikarakorsk ceramics. To date, this is perhaps the only true artwork on the Don. All products are made of white clay completely by hand. The assortment is wide - from miniature souvenir figurines to whole sets. Addresses: Bolshaya Sadovaya, 77/24. Phone: +7 (951) 509-69-39. Prospekt Budennovskiy, 61. Phone: +7 (863) 267-96-45. Where to buy: Central market, Budennovskiy avenue, 12. Fish - from 250 rubles. When buying fish, you should take care of its transportation and provide a sealed packaging so that the fish does not emit an unpleasant smell. There is a misconception that in the luggage compartment of the air temperature is much lower than in the cabin. In fact, this is not so, the difference is insignificant. Therefore, to prevent the fish from deteriorating, it should be placed in a sealed food container, or even better in a refrigerator bag. This will solve several problems at once: it prevents the spread of smell, things do not get dirty, and the fish "flies" to your destination fresh. Well, and if you travel by train, such a package, among other things, will save you from the skewed looks of fellow travelers - a strong fishy smell will not appeal to everyone, especially on a hot summer day. In the market, you can also buy jam from mulberry, which in Rostov is called a citron, watermelon honey nardek, as well as halva, and kozinaki. Where to buy: Central Market, Budennovskiy, 12. In Rostov, handicraft cheesemaking is developing, so that a delicious souvenir can be the head of a spicy product made from organic milk. For example, you can look into the "Vysenko cheese-making plant".